It's a big week for the MVP poll. Two of the top three candidates played each other on Sunday night, when one outplayed the other. And while there's a change at the top as a result, neither is our new No. 1. It has been Carson Wentz at the top of our poll since we started it at midseason, but Tom Brady has been right behind him the whole time. And while it was Russell Wilson who helped end Wentz's win streak, he wasn't the one who zoomed past the Eagles quarterback for the top spot in our poll. With four weeks to play, the MVP leader is a dude who has won it twice before. Can Brady hold on? Is it fair to knock it away from Wentz after one down week? And how much gap-closing do the Seahawks need to do in the standings to put Wilson in the lead with all he's doing for them? These and other questions are discussed at some length in this week's edition of our MVP poll. The case for Brady: The Patriots' 10-2 record is tied with Philadelphia and Minnesota for the league's best, and as we keep saying here, the quarterback on the team with the best record is always a candidate for MVP. Brady leads the league in passing yards by 330 and ranks second in yards per attempt, fourth in QBR, second in completion percentage and second in touchdown passes with 26 to just four interceptions. We may never know what he was yelling at offensive coordinator Josh McDaniels about on the sideline last week, but we do know Brady is unstoppable even at age 40. The case against Brady: Well, Wentz has Brady in touchdown passes and QBR, but not by much. And as we'll discuss below, Wilson is shouldering more of his team's offensive load than any player in the league. But those are the cases for those guys. There's no real case against Brady right now. The case for Wentz: The Eagles are also 10-2, and Wentz has more touchdown passes (by three) and a bit higher QBR than Brady. Even in defeat on Sunday night, Wentz managed to show flashes of what has made him so incredible. He's completing 66.4 percent of his passes on third down for a league-best average of 9.48 yards per attempt, 12 touchdowns and two interceptions. Dominating on third down and keeping drives alive is a way to rip out opponents' hearts. Wentz can do it with his arms or his legs, and knows when to do which. The case against Wentz: A lot of Wentz's top-line numbers just aren't elite. He's 26th in completion percentage, 10th in passing yards and 10th in yards per attempt. This is obviously nitpicking, but we're talking about the top end of a very crowded MVP field. When this many guys are playing this well, the only way to sort them out is to nitpick. 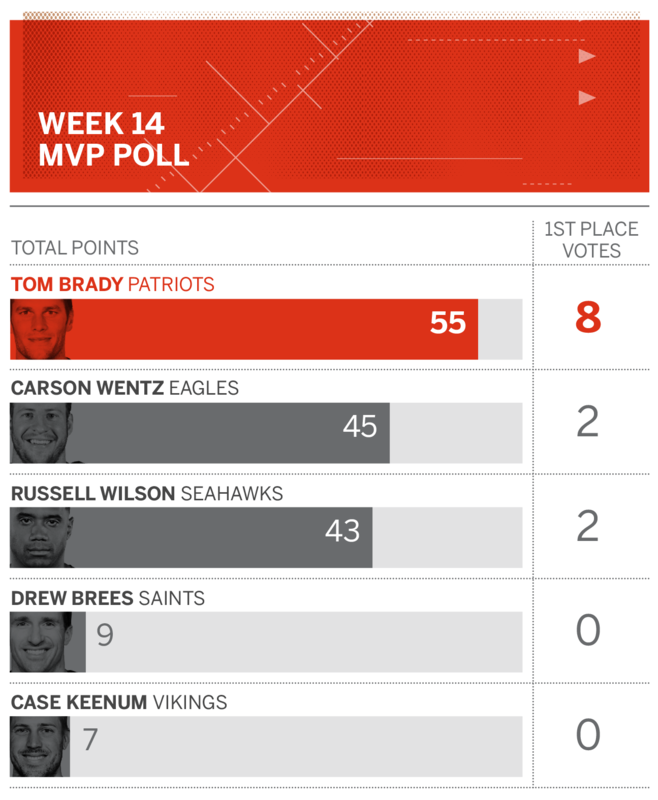 Wentz received two of the four first-place votes Brady didn't get this week, plus five second-place votes and five thirds. The case for Wilson: Did you watch Sunday night? Wilson does everything. Running back Mike Davis had 64 yards on 16 carries, which qualifies as a monster day by a Seahawks running back in 2017. Wilson leads his team in rushing by 224 yards and ranks sixth in the league in passing yards. With no line, no running game and a defense that's losing guys to injury every week, Wilson is probably -- by strict definition of the word -- as valuable as any player in the league this year. The case against Wilson: Seattle's 8-4 record is fine, but it's two games worse than New England, Philly and Minnesota, and a game worse than the Rams' record in the Seahawks' own division. Seattle is fighting for a playoff spot, and players on non-playoff teams don't tend to win this award. It says everything about Wilson's performance so far that he has two first-place votes, four seconds and five thirds in this week's poll. He has an arrow pointing up. The case for Brees: Leading the league in completion percentage at 71.5 while also ranking a respectable fourth in yards per attempt with 8.10. To put that in perspective: Minnesota's Sam Bradford set the NFL record last year for single-season completion percentage at 71.6, and he averaged only 7.02 yards per attempt. The case against Brees: Is he even the most valuable player on his own team? You could make the case for running backs Mark Ingram or Alvin Kamara, or cornerback Marshon Lattimore. Brees is doing nothing wrong, and he's playing the most important position on one of the league's best teams. But he ranks 11th in QBR and 17th in touchdown passes. Are those MVP-caliber numbers? The case for Keenum: Well, it'd be tough to put the quarterbacks of the other two 10-2 teams on here and not Keenum, wouldn't it? Keenum is eighth in passer rating, fifth in completion percentage and second in QBR, behind only the injured Deshaun Watson. He didn't start the first game of the season because the Vikings planned to go with Bradford. But he has filled in brilliantly and held former first-round pick Teddy Bridgewater's return at bay. The case against Keenum: Again, the stats. Keenum is just 14th in passing yards, 16th in touchdown passes and 12th in yards per attempt -- not elite numbers on par with what Brady and Wentz are doing. That takes nothing away from Keenum's success or that of the Vikings, and it could be that they need less from their quarterback than, say, the Seahawks do from theirs. But this is an MVP race, and a good one, and Keenum's numbers just don't stack all the way up.